Judging from the response to our post on Onyx Preferred Players Collection, you have some big time interest in this product. Hits on our post have been happening at a blistering pace. It looks like that response carried over to sales because according to Blowout Cards, all boxes have been sold out. Since there seems to be a lot of interest, here is some more news from Onyx. Hopefully this will give you enough lead-time if you didn’t get a chance to get in on their Preferred Players Collection. Boston Red Sox Pitching Acer, Jon Lester, who is already 4-1 for the season, is sending his game worn items Onyx. They are expecting cleats, hats, a fielding glove or two this month. He will also be autographing all those items. MLB April Rookie of the month, the Seattle Mariners' Pitching Ace Michael Pineda, who is also currently at a 4-1 record, will be doing his first public signing in the early June. Mill Creek Sports will be sponsoring the public signing in their store in Seattle, along with taking mail orders. Onyx will also be taking mail-in orders for a private session afterwards. 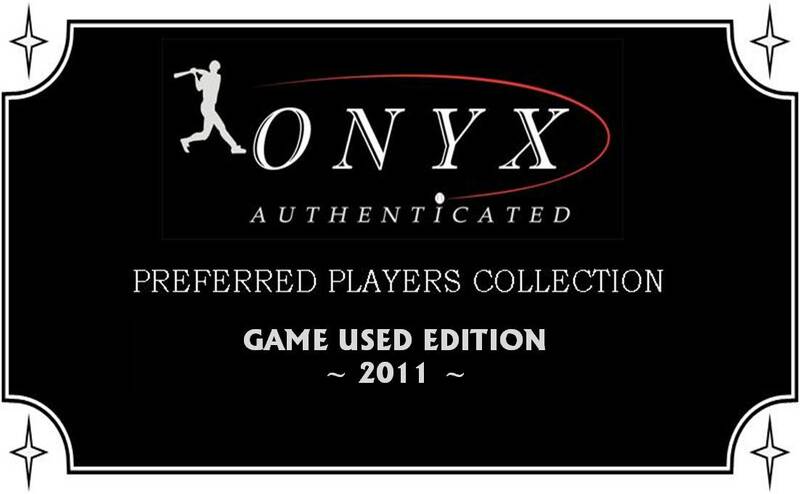 Onyx Authenticated will have game used items available. Both Lester and Pineda items will be included in a new Onyx release, Preferred Players Collection, Game Used Edition. Each wooden security sealed box will offer a pair of game used gloves from rising prospects, Major League Players and MLB All-Stars. In addition, one in four boxes will offer redemptions for game used jerseys, cleats, fielding gloves, bats and hats. Product release is scheduled for late July with an extremely limited run of only 150 boxes, which translates to 50 cases. The checklist is still in the works, but we will pass it along when it becomes available.